In the digital age we are still plagued with the possibility of theft and hardware failure, to name a few. File Backup to dvd’s and cd’s can wear down with time, and data backup to hard drives can fail, get stolen or break. With our premier cloud storage facility, all these problems are eliminated. 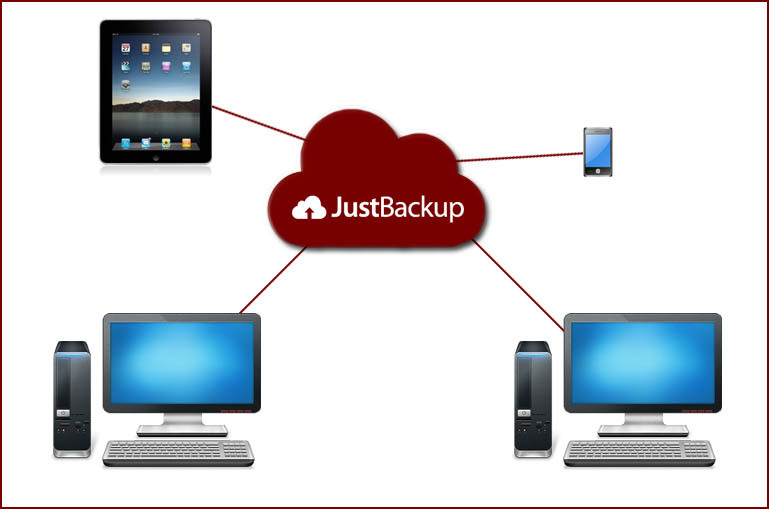 With JustBackup you can have ease of mind that your server, laptop, desktop computer and mobile device has an incremental back up straight to the cloud. Your data can also be synced via the cloud to another device. The cost effectiveness, features and robustness of JustBackup, combined with the enthusiasm of In Touch With The World - makes JustBackup the most competitive cloud storage and sharing service on the market today. All backups are done automatically at a specified time. Upgrade from daily, to hourly backups. Your account is being monitored 24/7 by our data center team, and you will be notified should a backup fail or not execute at the specified time. Keep multiple file versions backed up. Multiple Devices on one account. Backup to the cloud and sync various folders across multiple devices. Incremental or complete backups available. Restore data anytime, anywhere, to any device. Retrieve your files via the application or through a web browser. Share folders and files from your cloud to a friend. 100gb storage. 1 Device License. 200gb storage. 5 Device Licenses. 1TB Storage. 50 Device Licenses.